Hatfield-McCoy Regional Recreation Area, better known as the "Hatfield-McCoy Trails," is a professionally designed trail system that provides a safe recreational experience for all-terrain vehicles, off-highway motorcycles, mountain bikers, hikers, and equestrian users. The first 300 miles opened to the public in October 2000. Currently there are 500 miles of trails with expansion plans continuing until the trails reach a network of 2,000 miles with continuous trails weaving throughout eight counties in Southern West Virginia (Boone, Lincoln, Logan, McDowell, Mercer, Mingo, Wayne and Wyoming) on private and corporate owned property. The trails have sold over 23,000 permits since opening and have had visitors from forty six states and six countries. Survey data indicates that 57.3% of visitors are very likely to return and feel their visit was "Great- worth the trip" and 34.8% indicate the trails are "Awesome- best place ever ridden." The intention of the trail system is to provide the finest recreational trails experience in the country. The trail system compliments the natural beauty of the Appalachian Mountains and is one that cooperating landowners, area residents and businesses are proud to host. The trail system has sparked an entrepreneurial spirit throughout southern West Virginia. Many new businesses have been generated and old businesses on the verge of closing; have now been rejuvenated. The Hatfield-McCoy Trail System is designed on privately owned property. Each trail within the system is numbered and rated according to difficulty (Green = Easiest, Blue= More difficult, Black = Most Difficult and Orange = Single Track). The BLM provides oversight on construction, maintenance, and environmental issues. The trail systems currently connect to the Town of Matewan and the Town of Gilbert. This allows trail riders to enter towns for lodging, food, water, etc. The Hatfield-McCoy Trail system interacts with many historical towns, monuments, museums and other tourist attractions such as: the Matewan Massacre, Twisted Gun Golf Course, Shawnee Living History Trail, Coal Heritage Trail, Chief Logan Civil War and Indian Museum, and Hatfield Cemetery, where the famous "Devil Anse Hatfield" statue is located. Each town has its own unique history and places to visit. The Hatfield-McCoy Regional Recreation Authority not only draws interest to the trail system: once visitors are here, they are anxious to learn the history that surrounds southern West Virginia. The cost of a 1-day permit is $15, a 7-day permit is $35, West Virginia residents pay $25 per year and out-of-state residents pay $100 year. 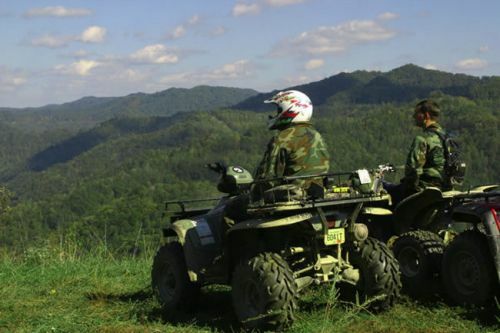 The Hatfield-McCoy Trail System has been featured in many popular sports oriented magazines such as Dirt Wheels, ATV Action, ATV Sport, REV Magazine and ATV Magazine. ATV Magazine TV, aired a 6-minute segment on the trails on Outdoor Life Network and The Discovery Channel. The Hatfield-McCoy Trails website (www.trailsheaven.com) received 2.3 million visits during the month of June 2003. Finally, the Coalition for Recreational Trails recently awarded the Hatfield-McCoy Trail System the "2003 Acheivement Award" for Outstanding Use of Recreational Trails Program Funds in the category of Construction and Design - Long Distance.